Delicious and nutritious oriental inspired lunch or dinner option. 1Combine marinade ingredients and allow steak to coat in an air tight container for 2 hours in the refrigerator. 2Chop shallots, button mushrooms, peppers and bok choy. Sauté in vegetable oil on medium heat and lightly salt until colours brighten and shallots are golden. 3Remove chopped vegetables from pan and set aside in foil covered bowl. 4Slice 1 inch stock off enoki mushrooms and separate into strands. Blanche in boiling hot water for 20-30 seconds and strain. 5Cook soba over stovetop in salted boiling hot water for 5 minutes. Strain. 6Combine Soba and enoki mushroom into sizzling hot pan with sesame oil and stir in sautéed vegetables. Salt to taste. 7In separate skillet, add marinated skirt steak to sizzling hot pan and cook on either side until marinade caramelizes and steak is medium rare. 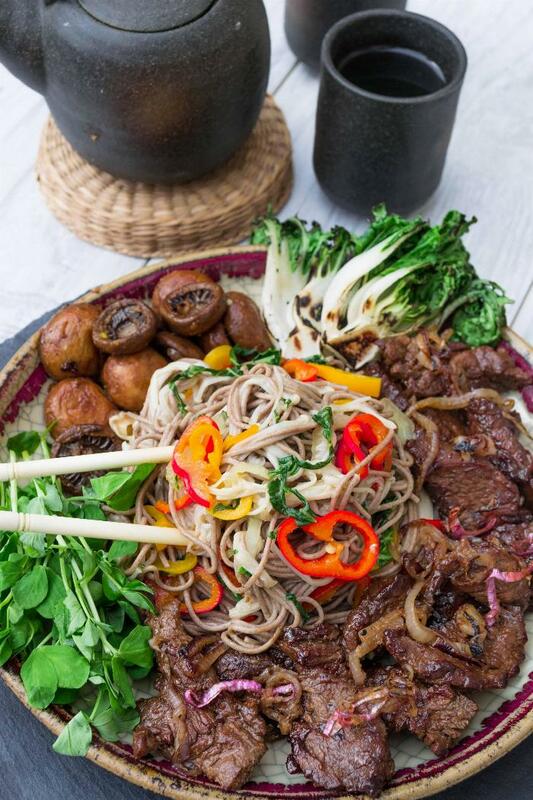 8Add steak and soba to dish, garnished with fresh pea shoots and charred bok choy. Pour any left over steak sauce over noodle and enjoy!